Criteria: A4: Exhibit a high quality of architectural design without regard to the time built or historic associations; A8: Exhibit an unusual, distinctive or eccentric design or construction technique, which contributes to the architectural interest of its environs as an accent or counterpoint. Details: Church: Large front steeple, copper finials, copper cross finial on spire, carved stone gargoyles, brick and stone buttresses, large stone arched entryway, carved stone window surrounds, stained glass windows, coursed ashlar stone base with cut stone watercourse. School: stone window surrounds, c. 1920 metal casement windows, stone and brick entry with stone crosses, shields and comings, copper gutter work, fine brick joints, cut coursed stone base with sloped overhanging water course. Construction Year: 1928 - 806 and 808 Ridge Avenue - three buildings including Rectory; 1904 - 810 Ridge Avenue - Church building. Historic Features: Cruciform church with attached L plan school, church has full height buttresses, recessed entry with stone columns, arch, coping cross and trefoil medallion; school is simpler with stone base, 45* birch and stone entry at L, 2-1/2 stories with gable dormer over entry. 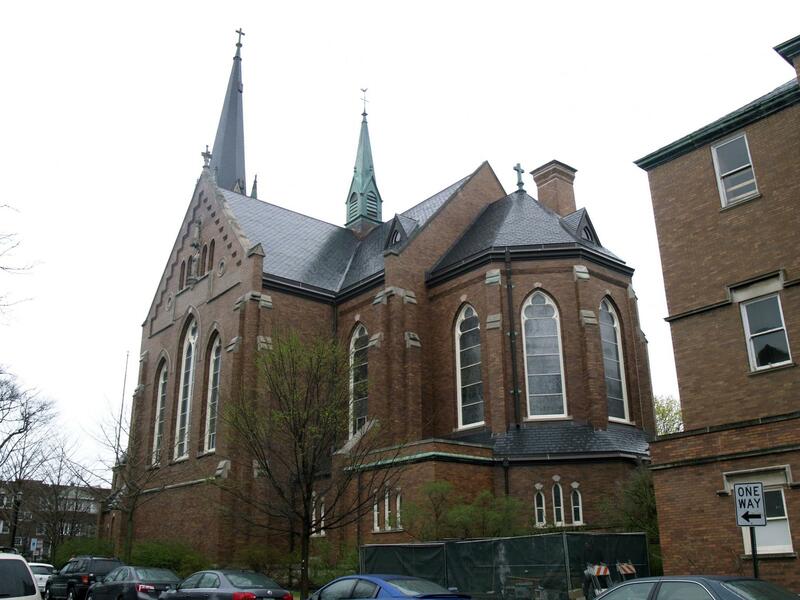 Original Architect: Not noted on permit application 2288 for Church, Herman J. Gaul & Sons for Parish House. Architect Source: Permit application #18438 for BP#18145 for Parish House. Builder: M. Foley (Mason) and Rauen (Carpenter) for Church, Math. Rauen Co. (Mason and Carpenter) for Parish House. 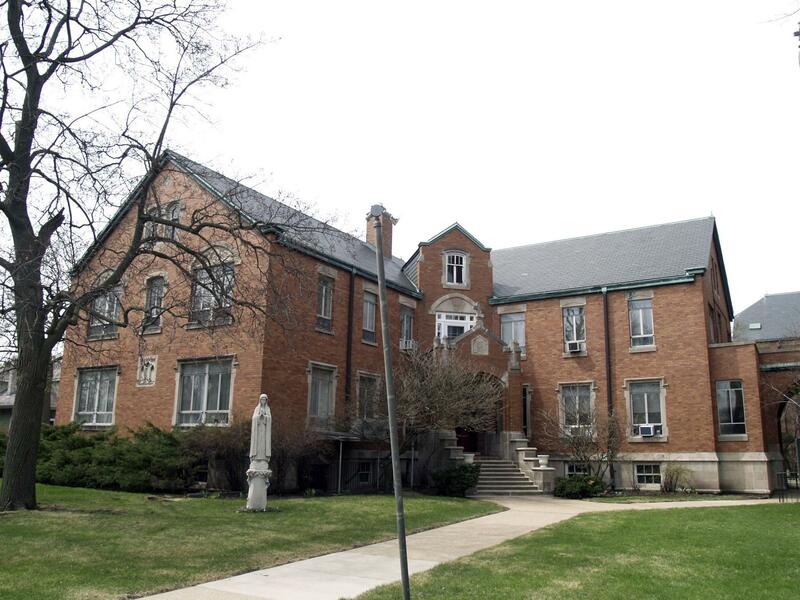 Date of Construction: 1928 - 806 and 808 Ridge Avenue - three buildings including Rectory; 1904 - 810 Ridge Avenue - Church building. 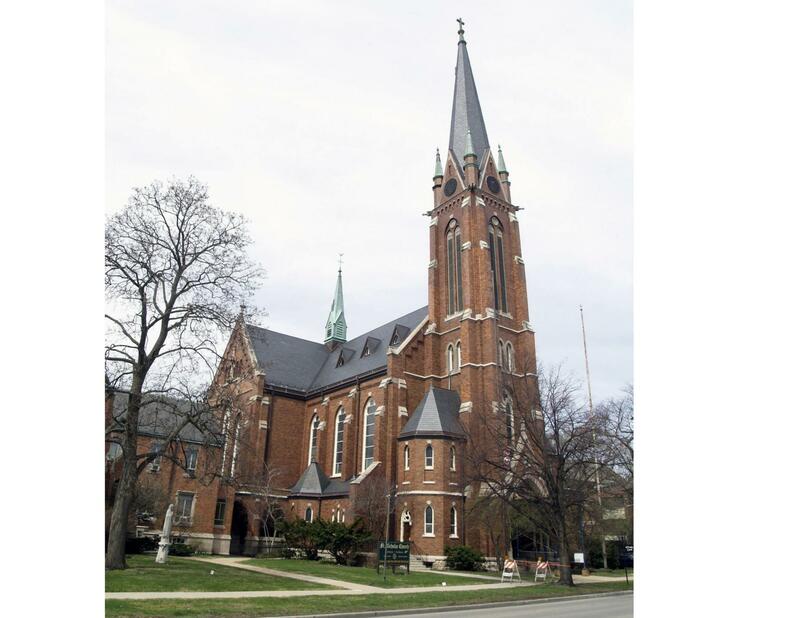 Cost: Not noted for Church on permit application #2288; $50,000 for Parish House (changed in pencil to $70,000 on permit application #18348).